KEEP UP WITH WHAT’S GOING ON IN BALI @thebeat.bali You can’t beat that. 25. JOSH BUTLER This UK house beast is about to make you fly into the sky! Kudeta style. 28. davide squillace It’s all about juicy beats when Davide is on the decks, find out for yourself at Ruby. 30. jeremy olander Emotive melodic techno at Jenja. 40. SEBASTIAN LEGER Sundown Sessions with melodic mastermind. 56. seasalt Try out the new menu at the stylish Alila - Seminyak. An incredible experience awaits you at Cuca Jimbaran. Whether you want to chill or not, Alternative Beach has got you covered. The astounding ocean side views at Karma Spa will be enough to make you stay. The Beat Magazine is Bali and Jakarta’s entertainment gigguide. Pick it up free at the airport, bars, restaurants, clubs, hotels and Circle K in Bali. 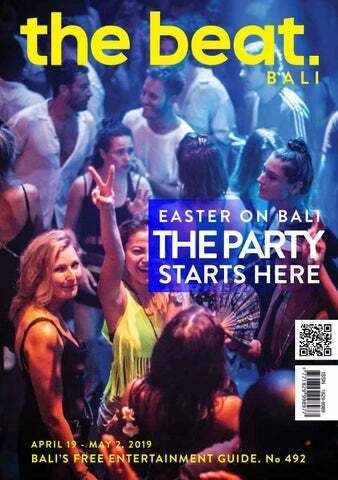 We are an independent publication and our aim is to entertain and guide you thru the nightlife and more of Bali and Jakarta. for young and old at Omnia Day Club with Luciano providing some solid techno and Fat Boy Slim doing his fun house stuff at Ulu Cliffhouse. Add to that the normally rammed Single Fin Sundays and you would have to say Uluwatu area is becoming as busy as anywhere in the nightlife stakes. And it doesn’t stop there as this weekend, with Easter arriving, it is sure to be busy all over town. Check inside for what’s going on over the next two weeks. The opinions expressed in any article or advertisement are those of the writer or advertiser and not necessarily those of the Beat. The Beat crew takes no responsiblity for anyone caught out in the photos. 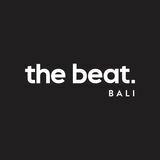 our instagram page @thebeat.bali. Watch out for another mad-capped weekend on the way. The Beat magazines are now available to download for your device on Scoop Newstand. Go to www.getscoop. com to download the application. Sponsor a Disadvantaged Woman Student Empower marginalized women and join Bali WISE in the mission of breaking the poverty cycle in Indonesia once and for all! Help sponsor Bali WISE as they are urgently looking to accommodate their students from financially challenged backgrounds. Your sponsorship of $110/month would mean that these young women would get the proper skill education, three meals a day and also an allowance for them to send back home. You can visit their campus and meet the students directly on Jl. Siligita No. 22 – Nusa Dua (next to Cocomart). Any help from you will be greatly appreciated. For any more information contact Fena@baliwise.org (www.baliwise.org). Omnia continues their month long, One Year Anniversary celebration over the next couple of weekends on the south Uluwatu cliffs with Martin Garrix, Above & Beyond, Giolì and Assia, Kaskade, Oliver Helden and Claptone ready to spin their sounds. The venue has astounded punters from day one and continues to do that every day since. If you haven’t been down ever or recently, this is the time to give it a whirl. Check inside for the dates. In Awe of waisak Day’s Celebration Waisak Day, also referred to as Vesak Day, which will fall on May 19 is a national holiday locals in both Bali and Indonesia as a way to honour and celebrate Buddha.This celebration day attract pilgrims from all over the world as Vesak Day is the holiest day on the Buddhist calendar. Locals and foreigners who ascribe to Buddhist teachings will gather at various temples at dawn.This is then followed by the raising of the Buddhist flag accompanied by the placing of offerings at the feet of Buddha statues peaked by the release of thousands of lanterns towards the night sky which will be a beautiful sight. Tourists are allowed to come and watch the ceremony. One of the most popular DJs in the world, DJ Martin Garrix makes a return to Omnia with a special appearance on Good Friday, April 19 Six years after his single, Animal, released in 2013, exploded all around the world, the chart-topping DJ Martin Garrix has released a slue of top hits. He is constantly spinning at the world's biggest festivals and this week we have him down in Uluwatu for your enjoyment. Be there early to enjoy the full day, or get there around sunset to watch the main man do his thing. Genre : EDM popular bangers. One year of Omnia Day Club, and we are celebrating with Above & Beyond on Saturday, April 20! Making a grand return to the cliffs of Uluwatu, the biggest name in the world of trance ABOVE & BEYOND are back to show their collective trance, anthems and hits!Check in by 5pm to guarantee yourself a good spot on the dance floor! Genre: trance. Get ready for a fun filled day at Kudeta for their Easter Sunday celebrations on Sunday, April 21st. Expect family activities galore, as the KDT juniors get busy with arts and crafts, learn tricks from the Bali Circus and enjoy an Easter Egg Hunt and a surprise appearance by the Easter Bunny. An exciting chocolate workshop in collaboration with Primo will be going down, upstairs at Mejakawi. Learn how to temper chocolate and leave with a bunch of handmade Easter chocolates! Limited space available. From 4 PM they'll be welcoming queen of the Australian funk scene, Kylie Auldist. Described as the 'high priestess of soul', to round off a fully packed day of Easter fun! Starts at 12pm. Remembrance night with entertainment live Band, charity quiz, Two Up Game & Beer drinking competition. Starts 8pm. DJ Leea makes her first appearance at Envie Lounge this Friday night, April 26. Bistro C smoke house & sports bar @Finns Recreation club Open daily to the public from 7.00am - 10.00pm. FEATURE One of Frances most outstanding electronic music DJs and producers, Sebastien Leger is a frequent traveler that continues to show the world his blessed skills. Conjoined with Mixmag, the W will host a series of three Sundown Sessions live from Woobar, kicking off on Saturday, April 27 with Sebastian. Parallel to building his international DJ career, Leger has also become one of the world’s most sought-after producers and remixers, having gained a lot of success through his releases on labels as diverse as Dirtybird, All Day I Dream, Systematic and Lost & Found to name a few. We caught up with him before the big gig to speak about his style and what to expect on 27th sunset of April. When did you start DJing - and what or who were your early passions and influences? Started DJing in my bedroom in 1994, so that’s 25 years ago, I got my first residency at the age of 16 in a gay club in France. Early love was US and UK garage house like Frankie Knuckles, David Morales, Masters at Work, then Chicago House with Dj Sneak, Derrick Carter and Paul Johnson. Apart from that, Disco and Funk from early 80’s. How would you describe your DJ performance/ music style? I like to play happy music rather than dark and depressing. I like to install a groovy vibe in my music. Best collaboration ever? Daft Punk vs Stevie Wonder sounds good to me. Also Me vs Myself says it all. What is your proudest moment? My proudest moment isn’t a moment but more of a statement, the fact that I have been doing this my whole life and I’m still here and relevant, looking for more goals and always reach higher steps. Longevity is something I’m proud of. Have you collaborated with Mixmag before? If yes, how was it? Yes, I did play at their headquarter in NYC at the Lab. It was fun to do, I’m happy to do that again in Bali with a different landscape! You’ve been playing at W Bali several times, what do you expect from the upcoming gig? I’ll play outdoor this time rather than the club down there, so it will be different vibes I guess, but I have no idea what to expect but a sunset and my music. But every time I played there at the W Bali, it was always really fun, I love it! What’s your perspective on the balance between technological advances, music and the art of DJing? I’m not a vinyl nostalgic, but I’m not into the thing with too much gear in a booth doing whatever noise and layering millions of loop together. I’ll stick with the good old playing two good tracks after each other, that’s what I’m after rather than looking like a nerd in front of a screen moving knobs on controller that people have no idea what is going on anyway. How have particular technologies changed your style of DJing? I travel lighter obviously! That’s pretty much it, Djing the same way as before, 25 years ago. 1.Beach or mountain? Beach, but I don’t go on the beach for me, my dogs love it thou. (I live next to the beach) 2. Ibiza or Bali? Bali, no doubt about it. 3. Sunrise or sunset? Sunset. 4. Eggs: scrambled or sunny side up? Boiled with mayo thanks. 5. Cat person or dog person? I have both. I love them equally, but dogs have that very personal thing that touches me more. Catch Sebastian Leger at Woobar Saturday, April 27, 2019. FEATURE In just a few short years, Josh Butler has garnered a solid following within the international house music industry. Since his successful release “Got A Feeling” in 2013, Butler has made his mark as one of the premiere house music talents from the UK. His label ORIGINS RCRDS has seen releases from the likes of Kerri Chandler, Richy Ahmed and Huxley to name a few. 2018 was Josh’s most accomplished year to date, with several appearances at Ibiza’s Amnesia, Privilege and the iconic DC-10 closing party as well as festivals like Nocturnal Wonderland, FNGRS CRSSD and throughout Miami Music Weak. Not to mention his releases Hot Creations, Defected and most recent “System” Ep on 8Bit Records. The Beat spoke with Josh from NZ, where he has been touring the southern summer, before his gig at KU DE TA on April 20 about the past, the present and what’s to come. Hey Josh! Can you give us a little rundown on how your DJ career began? I guess it began when I lived in NZ, I bought my first set of decks at age 14/15 and started to DJ at kids parties from school. They all wanted me to play hip-hop which I wasn’t really bothered about but it was the only opportunity to play music I had at the time. I then moved back to the UK when I was 17 and started to make friends in dance music and within the pockets of the scene that I was really interested in. What are some of your most cherished moments so far as a DJ? Playing at Glastonbury is certainly up there. I opened the Block 9 Genosys stage on the Thursday and it was absolutely packed, I definitely didn’t expect so many people to be waiting! It’s also amazing for me to now be travelling back to New Zealand, the place where I spent my teenage years, to play the music I love. House music is really taking off over there now. you feel are the most significant to you and your career? ‘Got A Feeling’ was definitely my first significant release, and it gave me a great platform to build my career from and explore other areas of house music. Working with Kerri Chandler on our track ‘Can’t Deny’ is definitely a personal career highlight, as well as remixing legends such as Carl Cox and Fatboy Slim. You’re currently on an Australasian tour. How is that going so far? Where have you been playing and has anything changed DownUnder in the music scene since your last trip? As I hinted at with the NZ scene, things feel really strong on this side of the world right now - house and techno music is such a dominant sound here! The tour itself has been an ideal balance of parties, but also chilling with friends and family as my Dad is still based over in Auckland. What are some of your favourite clubs/parties to play at on this side of the world? Electric Rush in Queenstown and also Revolver in Melbourne. Both are very special parties in their own way. What are your plans for the upcoming summer season? I’ll be over in Ibiza playing at DC-10 for Paradise, for Black Coffee’s party at Hï Ibiza, plus more dates with Defected and a few more to be announced soon. There’s also some trips to Central Europe, America and Canada for festivals too. Unique Villa Mathis compound surrounded by rice paddies and tucked away from the hustle and bustle of South Bali offers a serene sanctuary and the vibe of old Bali. Umalas area – home to Villa Mathis - is conveniently wedged between fancy Seminyak and hip(ster) Canggu and still maintains a lot of its original slow and sleepy character of the small, rural village. What makes Villa Mathis truly special is its settings. The private villas and rooms are dispersed on a one hectare property of perfectly manicured lush, tropical garden. It’s filled with tall swaying palm trees, verdant vegetation of all shapes and colors and beautifully smelling Frangipani trees – one of the symbols of the island. Balinese use the trees’ beautifully shaped flowers in their many every day offerings. The art of hospitality is reflected in every detail at Mathis. All rooms are different, but unified by the same soft and sophisticated atmosphere and designed with privacy in mind. For interiors, you’ll find traditional Balinese materials used throughout – sturdy teak wood furniture with its distinctive brown – yellowish color, signature “alang-alang” elevated roof and drapes and cushions in batik. The rooms open onto a patio surrounded by tropical flowers for complete privacy. There is four different sized pools scattered across the property, complemented by cabanas, gazebos, sun bends and a variety of intricately designed nooks and crannies. The opportunities for quiet relaxation are boundless. There is a muted Balinese gamelan music played throughout the estate in evenings, adding another authentic cultural touch. offers romantic, fine dining at its best. The young and creative culinary team serves the spicy Balinese cuisine mixed in with other flavors of the Indonesian archipelago. The four compounds are cleverly connected by secret passageways, small paths and walkways over charming lily ponds. The modular architectural design allows for a complete sense of intimacy. Because of this intelligent make up - it can be booked by a room, four or five-bedroom villa or even as an entire property for any occasion. You might be surprised to find out you can also pick your favorite place throughout the property and have a unique dining experience outdoors. The villas and the charming land it sits on, are so thoughtfully designed, appointed and decorated to the single last detail, they look like they fell out of the pages of Architectural digest magazine. Hot tip: Book your stay on www.mathiscollection. com for the best deals! THE LABEL Meet the new minimalist label producing sustainable swimwear in timeless, simple cuts. To adhere to their eco ethos set all around the brand, the swimsuits are designed from the rib fiber and recycled Italian nylon. The latter is eco-friendly and heavily resistant to sunscreens and chlorine to make sure it has long and happy beach life with you. The swimwear line is complemented with organic, bamboo and linen based apparel. Hanyas’ collections are inspired by the diverse island archipelago’s rich culture and hand made in Bali by local artisans with focus on premium quality and versatility of their products. We instantly fell in love with their precisely fitting one pieces. You can take them from the beach to the cocktail hour – they look perfectly chic and stylish paired with a piece of high waist denim. FOOD Indonesia to implement the sustainable, zero-waste concept behind the bar, reusing, fermenting, recycling and up-cycling ingredients that would otherwise be discarded as trash. Think leftover fruit juices, fruit rind and fruit seeds saved from the scrap heap and instead strutting their stuff in exciting ocean inspired craft cocktail creations. At Seasalt, it all comes together brilliantly in the hands of the award-winning mixologist duo of Ayip Dzuhri, crowned Indonesia’s Bartender of the Year in the Diageo World Class Competition in 2015, and Daniel Gerves, Alila Seminyak’s Beverage Manager and finalist of Bali’s Captain Morgan Cocktail Competition in 2017. Stationed in the middle of Pererenan, Front Café have quickly made a name for themselves. Hosting an artsy space, with a minimalistic layout, Front Café offers their own blend of coffee and serves simple, delicious brunch styled food. Breaking free from the trends in your everyday Canggu cafe, Front prides itself in being different from the rest. Check out what they have to offer if you’re passing through Pererenan or happen to be a lucky resident in the area. Sista Canggu At the start of the year, Sista Café introduced itself as a new modern Chinese French fusion restaurant. They offer a range of refined Chinese favorites with a heap of healthy steamed Dim Sums among other excellent dishes. Open for breakfast, lunch and dinner – with a solid backdrop perfect for your Instagram, not to mention the luscious rice field view as well. If you want to eat at home, check in to their dumpling deli and get some frozen dim sums to go. If you are familiar with the French x Chinese fusion, you might have heard of their older brother, Bro Café is a fave on the Batu Bolong strip. Get down today and feast away on all the amazing selections of food & drink! here casual eating meets fine dining – Cuca in Jimbaran is top of the list in restaurants you can enjoy with a date and not break the bank. The overall ambience and staff professionality were the first things we noticed, feeling comfortable quite quickly within our surroundings. Dubbed as a top 10 restaurant in Asia, Michelin-trained Chef Kevin Cherkas launched Cuca in 2013 featuring a menu with a range of “Tapas” and incredible ingenuity. Proudly serving 100% local produce, Cuca stands out with their creative cooking methods and the combination of flavour, texture and visual presentation. Think of eating at Cuca like going to an art exhibition and being able to share and eat every last bite of what you’re looking at. How is that not going to impress your date? bouche, consisting of two Bali-inspired Ayam Betutu cotton-candy bombs! The salivation began. We sipped on some fresh mocktails (75k each), whilst patiently awaiting our first course – within a matter of minutes, a white rose and a dollop of luscious pink sauce landed on our table. The Smoked Butterfish (110k) had arrived. A heavenly combination of soft butterfish, beetroot yoghurt and parsley crumbs melted away in our mouths, leaving us very excited for the courses to come. FOOD continued with one of the signature vegetarian dishes â&#x20AC;&#x201C; the Honey Baked Pumpkin Salad (80k), which looked like an enchanted forest and tasted otherworldly. We would eat this dish every day for breakfast, lunch & dinner! Next up was the remarkably well-cooked BBQ Octopus (120k), with an Asian gazpacho sauce that melted our heart & soul with its originality and vibrance. We could not stop licking our plate. The last of our mains was the Crispy Fried Chicken (90k) â&#x20AC;&#x201C; another piece of art, so tasty and pretty enough to even make a pescatarian want to try it, twice! We rounded off the meal with two incredible desserts.The Caramel Apple (90k) and the Bali Breakfast (100k). The latter of the two sparkling with passion and creativity, with the oozing mango egg yolk mixing into the frozen passionfruit and whipped coconut, creating a beautiful ending to our Date for Two. If you are looking for that perfect date-spot, look no further than Cuca Jimbaran. look wonderful for the photos.They even came with edible flower petals, and the portion was quite big.We also completed our morning meal with a high quality cup of Italian coffee and a healthy fresh juice. The price of breakfast at Tempted Restaurant depends on the selection of food that you choose. The food items range between IDR 70K to IDR 110K. This well-priced restaurant not only includes a fresh and healthy menu but the food tasted delicious! Head down to Lebak Sari street and try their unsuprisingly mouthwatering food. Chef: Suastika Seeking classic Irish food? Look no further than Gracie Kelly’s Irish Pub. Bali’s first Irish bar located at the Bali Dynasty Resort. Don’t know what to order? You can’t go wrong with the chef recommendation, Gracie’s Traditional Irish Stew (IDR 120K). In this hearty warming stew, lamb is rendered spoon-tender by simmering and then slow baking with plenty of filling potatoes and aromatic carrots and onions. For bright colours and a bit of verdant sweetness, celery and thyme are tossed in toward the end of the cooking. Served with sesame toast to mop up the rich sauce. And be sure to top everything off with a cold draft Guiness from their drinks selection. Servo is an homage to a life on the road, the search for a four n’ twenny pie and choccy Big M, the sweet sensory cocktail of diesel fumes and brow sweat... A collection of essential pieces for every surfer on their way down the coast. There’s no sense in nonsense when the heat gets hot. Pull in to Servo and refuel on their website or local store. The Bleach Room store is a true reflection of this creative melting pot and at the heart of this new concept store located in Berawa, hashtag ‘I Promise’. ‘I Promise’ is the mission statement of the store. Promising to create and build a better community through design. The Bleach Room Store in essence is a socially conscious fashion forward boutique, celebrating Bali’s subculture and connecting local and international designers, artists and musicians. Highlights are the custom vintage denim and limited edition designer jackets, not to forget a never ending supply of unique graphic T-shirts frequently seen on the streets of in Paris during fashion week. Check their store in Tamora gallery Berawa to get some great new pieces for you wardrobe. 7/10 orchestral maneuvers in the dark. James Blake Assume Form James Blake’s transition from post dubstep producer to contemporary songwriter was something akin to the metamorphosis of a ghost assuming form. Blake has certainly come a long way from the spectral tones of his applauded debut, and this first album since moving to LA sees yet another character come into focus. Out goes the skeletal choirboy and in comes the A-list collaborator recently sought out by Kanye West and Kendrick Lamar. The result is a revelation. On the title track, with its intoxicating mix of orchestral strings and subtle electronica, even Blake sounds rather startled as he sings about this new presence. Sophomore album from Wisconsin-based nu-folk collective. Blake contemporary on fine form. Beck Morning Phase Sea Change revisited by pop’s great chameleon. Inubox Here’s one for any dog owners that don’t have a garden for their pup and have some extra cash to splash. This automated indoor toilet works by detecting your dog’s steps on the platform and taking care of the waste by itself and closing itself when not in use. Behind the closed door if the Inubox, a cleaning cycle removes waste, whether liquid or solid, it is processed and put into a closed bag, later cleaning its surface for the next time your dog needs to do its duty. Specifically designed to make sure you don’t have to deal with your dog’s waste while maintaining a clean, fresh smelling home. Inubox is currently at its Kickstarter stage and will be available for pledging at $696, planned to be available in November 2019. Learn more at www.inubox.net. Stephan Kotas Prague born photographer, Stephan embodies the word versatile. He traveled the globe since a young age documenting adventures, shooting places and faces he met along the way. Finally, he found his home in Bali but still travels worldwide for assignments. He specializes in fashion and art photography, commercial assignments and creative directing. His current artwork is Colodian Wet Photography. from the past, the people usually stay in a very “stiff” positions as they need to hold pose for at least 10-20 seconds. So the technique requires quite some skill from the model as well. After exposure I need to take the plate back to the darkroom to develop it and fix it. Then it needs to dry and be coated in varnish. After varnishing the images is safely sealed and will stay unchanged for hundreds of years! Where or what do your object come from? This technique is best for making portraits or shooting still scenes. I focus on art portraits of ordinary people, models, balinese dancers, or whoever I find inspiring. I also shoot private portraits for individuals, families or wedding couples. If you could pick one of your art works, which one do you like the most ? I like the image of Putu Bulan, a beautiful balinese girl. Its one of the first photographs I managed to successfully develop in Bali. Which makes it one of the first wet plate tintypes ever made in Indonesia! LOCATION Alternative Beach is the only all-encompassing day club in Bali that offers hostel accommodation (Kosone Hostel), private rooms (Canggu Village Accommodation), a Café (Eat Me), a fitness center (Wanderlust Fitness Studio), a spa (to be opened mid 2019) and a day club, all in one place. It is located right in the heart of Canggu and it’s close to cafes, restaurants, bars, temples, cooking schools and shopping centers. ATMOSPHERE Crisp Mediterranean whites, natural wood beams, flowing rounded walls and a fresh splash of palms, plants and cactuses are spread throughout the club. The use of recycled, natural woods throughout the building softens its imposing size and adds to its island feel. ACCOMODATION Kosone hostel offers shared dorms, spacious, Mediterranean inspired living areas, clean, well appointed bathrooms and fantastic views from the shared wrap-around balcony. There are a generous 40 bedrooms, each with eight king-sized, single beds that are large enough to sleep two people. The dorms are divided into a mix of shared dorms and female only dorms. Hostel features 24-hour reception, free Wifi and breakfast is also included in the room rate. Meanwhile, Canggu Village Accommodation offers pool access room (with courtyard) and rice field view rooms, which are completed with USB charging ports, cable TV, tea and coffee facilities, in-room safe, mini-bar, and Wifi. Your Passport to a New World of Wellbeing LOOK Nestled at the award wining resort on the cliffs of the Bukit, Karma Spa consists of four rooms divided into two locations, three on top of a cliff and the other right at the beach. We got the luxury to do the treatment in one of their cliff spa rooms. The scenic Indian ocean greeted our eyes as we stepped in. The room, with its blue ocean cliffside views, houses one lavish couple’s room decorated with beach vibes. We could almost feel the sea breeze sweeping our skin through the white curtains that hung gracefully beside. THE TREATMENT Karma Spa offers a wide range of treatments to create experiences that promote relaxation, balance and a sense of wellbeing. We tried their apothecary massage bar called “Feel Empowered”(IDR 1,250K++) for 120 minutes starting with a 15 minute infrared detox sauna session to eliminate toxins from the body. The therapist led us to their private open - air cliff top and assisted us to step in to the sauna room and left us soaking in the jacuzzi while enjoying the wonderful scenery and the sound of gentle lapping waves. After that, the therapist escorted us back to the spa room to receive a fully body scrub followed by a firm massage. The ultimate way to unwind and restore energy. INGREDIENTS To enhance the spa experience, Karma Spa works with the acclaimed organic skincare company, Sensatia Botanical and Jamu Tonic, to create a blend of local products that utilize lavender, cinnamon and coconut oil. They also created a scrub made from magnesium – filled sea salt to deeply cleanse the skin. MAGIC In addition to offering a selection of the most sought-after spa experiences, Karma spa offers a series of innovative treatments that push boundaries and bring new meaning to the concept of “Create a Wellness”. Highlights include a Balinese Wellness, a transformative experience that combines the sacred Balinese massage with a healing jade stone, to be used in a luxurious massage along specific points of the body to stimulate chi, circulation and bring guests on a spiritual spa journey, alone or as a couple. DISCOVER @LOST CITY FRIday, March 29 The soft opening of the new club on Echo Beach went off, with mounds of people cramming in to check the new space! Detroit Swindle @RED RUBY wednesday, APRIL 03 House connoisseurs Detroit Swindle showcased a wild display of skill on this grand night! EDX @SKY GARDEN FRIday, APril 05 A killer set by the mastermind on the decks, giving the Sky Dome a reason to dance! Modus @EC Karaoke SATURday, APril 06 New club room Modus opened at EC Karaoke with plenty of parking, good DJs and live music! The Him @OMNIA SATURday, April 06 Starting the month long birthday celebrations at Omnia with the emerging Dutch duo, The Him! USA @SOKA SATURday, APRIL 06 Getting turnt in Kuta with the one and only DJ USA! Weird Genius @LXXY SUNday, APRIL 07 A juicy improvised live set with the Weird Geniusâ&#x20AC;&#x2122;s at one of the hubs of electronic music in Kuta! Escape @LA BRISA wednesday, APRIL 10 A huge opening party for the Escape DJ crew, featuring groovy tunes and happy punters till the early morning! T.G.I.F @F BAR FRIday, APRIL 12 Fun times in the Dhyana Pura club with DJ Evan Andre! Chic @ENVIE FRIday, APRIL 28 A banging night with solid tunes, featuring Kent Kryptonite and Bobby K! Aries Pool Party @SKY POOL FRIday, APRIL 12 Sweet vibes at the Kuta poolside party with resident DJs and delicious food corners. Grand Opening @VAULT FRIday, APRIL 12 Great times at Cangguâ&#x20AC;&#x2122;s Vault with Canadian DJ Art Department grooving up the dance floor for their official opening party! Heatwave @WOOBAR FRIday, APRIL 12 Local talent Rayko was in control at the W with support by Seabass and Facenooks. Ben Nicky @LXXY SATURday, APRIL 13 A full house welcomed UK artist Ben Nicky to the stage for a night of absolute mayhem! Luciano @OMNIA SUNday, APRIL 14 A totally jamming set in the cliffsides of Uluwatu with the beast, Luciano! Ary’s Warung Bebek Bengil Bali Nusa Dua Café Wayan Theatre Cinta Grill Rest Boshe Gaya Gallery InterContinental Hogwild Jenggala Keramik Pundi-Pundi Grill Klapa Siam Sally Rest Le Meridien Tut Mak Café Rock Bar-Ayana Uma Sapna & Dava The Mulia CIRCLE K STORES all over Bali DENPASAR The Beat Akame is always Bali Adventure available from Tours our Petitenget Cafe Moka office. Look on Cellular World the Seminyak Flashy Clothing map in this Flo magazine for G Xtreme reference. This is a list of music bars and dance clubs supplying drinks, music and comfortable surroundings. Hand Loomed Garments in Cotton, Silk, Embroidery, Beading and Primitive Design for men and women. B AI NT PA JL. Rp 100,000 Spa Credit. Valid for minimum 30 minutes treatment. Valid at Finns Recreation Club location only. Not valid on retail products. Valid for one time use only. Subject to appointment availability. 15% Discount for FB with minimum purchase IDR 150k.